You may be wondering what could have possibly made me pick up The Mammoth Book of Body Horror. I have something of a soft spot for the body horror sub-genre, as it's pretty much the only type of horror that I can watch without having to worry that the orchestra will set off my noise aversion with jump scare chords. And having come across a book that included not only the inspiration for one of my favourite horror movies, John Carpenter's The Thing, but several other stories on similar themes, I couldn't really resist the temptation to check it out. 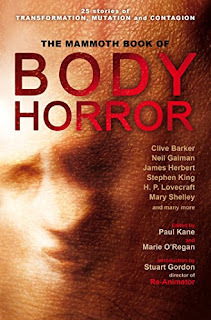 The Mammoth Book of Body Horror is a collection of body horror stories, ranging from classic writers like Mary Shelley and Edgar Allan Poe to more modern writers like Clive Barker and Stephen King. I can't believe I'm saying this, but I'm really rather disappointed. Considering just how grim body horror can get, I couldn't believe just how many more or less unequivocally happy endings there were in this collection. I could kind of understand this with some of the pre-20th century stories, but once you get to post-war stuff I was actively stunned by the unbelievable level of optimism that a share of these stories had. I mean, "Who Goes There?" the story that I picked up the volume specifically to read, has the characters kill off everyone assimilated by the Thing and then everyone has a big sigh of relief and gets back to work happy that they interrupted the Thing before it perfected anti-gravity. And no, that last bit is not an exaggeration, which only takes the story from mildly disappointing to outright silly. I think I'll stick to the film adaptation. There are also a few stories that I would argue don't really qualify as body horror at all. The two that stick out most in my mind are "The Telltale Heart" by Edgar Allan Poe and "Changes" by Neil Gaiman. I love both of these writers, but I couldn't tell you why either of these stories was included. With Edgar Allan Poe, not only does the inclusion not make sense, but it's made all the more baffling by the existence of his story "Ligeia" which is infinitely more appropriate for this collection. And with Neil Gaiman, the alteration detailed is gender reassignment. First, the last time I checked involuntary gender reassignment was claimed by the stupider sub-section of romantic/teen comedies. Second, nice going alienating your transgender audience. Third, it's a change that can be easily reversed, so it hardly counts as horrifying. It just fails as a body horror story on all levels. It's an interesting story on its own merits, but shouldn't have a place here. That negativity out of the way, there were a few stories that did scratch my body horror itch, if not to the extent that I had hoped. Probably the best of the actual body horror stuff was "The Body Politic" by Clive Barker, "The Chaney Legacy" by Robert Bloch, "The Look" by Christopher Fowler and "Residue" by Alice Henderson. Some stories that were good, if not necessarily proper body horror were "Survivor Type" by Stephen King and "Black Box" by Gemma Files.